The above diagrams show schematically the supposed structure of some of the simpler atoms. Fig. 4 represents the hydrogen atom, consisting of one proton and one electron revolving around the proton. The mass of the proton is about 1845 times the mass of the electron, and we assume that the proton effectively gives us the mass of the atom. Fig. 5 represents the neutral atom of helium. Its nucleus consists of four protons and two electrons, and it has two revolving electrons; in all, four protons with four positive charges and four electrons with four negative charges, the eight charges just neutralizing each other. Fig. 6 represents a helium atom which has lost one electron. It has, therefore, four positive charges and only three negative charges. Such an atom has a resultant positive charge, and is denoted by He+. 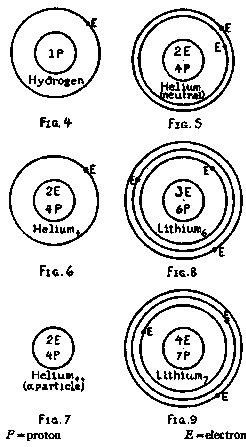 If the helium atom loses two electrons it is doubly charged with a positive charge (He++). The helium nucleus He++, as shown in Fig. 7, represents the particle emitted from radio-active materials.